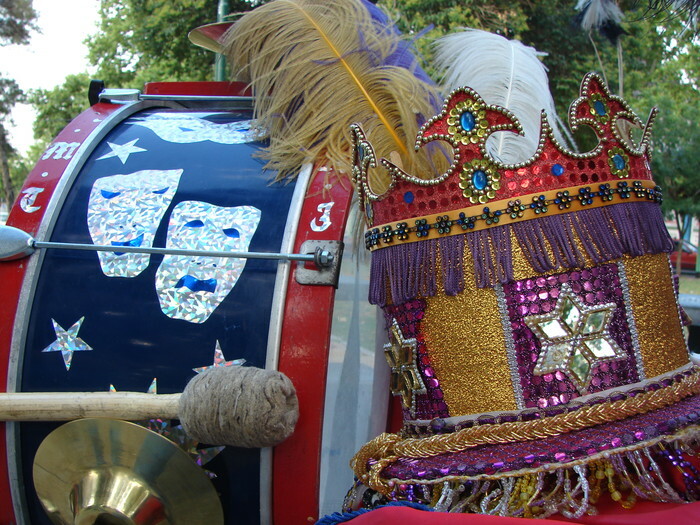 This year 112 murgas (a form of popular musical theatre performed both in Uruguay and in Argentina during the Carnival season) will shine in the 37 “Corsos” (Buenos Aires Carnival celebrations) organized in the districts of the City of Buenos Aires. Starting today, Saturday January 31st 2015, Carnival celebrations will run every weekend, including Monday February 16th and Tuesday 17th. Every Saturday the party starts at 7pm until 2am and on Sundays from 7pm until midnight. The corsos are held in all districts, each calling for residents and tourists. Murgas origin typically have a neighborhood and look through humor and irony to make a social critique of the country. Abasto: Cordoba between S. Bustamante and Agüero. Almagro: Corrientes between Medrano and Bulnes. Caballito: Avellaneda between Nicasio Orono and F. Sarmiento. Colegiales: General Lacroze between Martinez and Freire. San Telmo: San Juan between Chacabuco and Tacuarí. Villa Crespo: Scalabrini Ortiz between Corrientes and Velasco. Latin American street musicians, carnival groups from Brazil, Uruguay, Colombia and Bolivia were invited by the Government of Argentina to participate in these celebrations,where musical shows will be performed. Shoot a video of Argentina, place it on the map, share it and win one of 12 trips available. 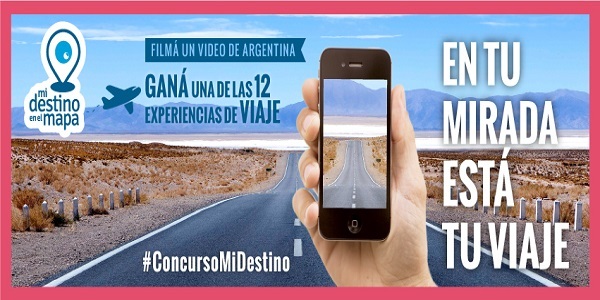 “My destination on the map” is a video contest, organized by the Ministry of Tourism of the Nation and Destino Argentina. The video can be of your place of residence (if you live in Argentina), your vacation spot, or any place you’ll be visiting in Argentina. You can shoot a landscape, a recipe, a song, an adventure, a story or a moment. You can use a mobile device, a tablet a pocket camera or a professional camera. With a maximum of five minutes, it may contain music, voice, ambient sound or your own voice. The contest will finish on March 30th, 2015, when the 36 finalist videos will be posted. Six of them will be selected by popular vote, and the remaining thirty by a commission of the Ministry of Tourism of the Nation and Destino Argentina. So go ahead, shoot your video, place it on the map, share and add votes to win. An expert jury and also the general public will vote and will designate the 12 winning videos, who can choose one of the 12 prizes. 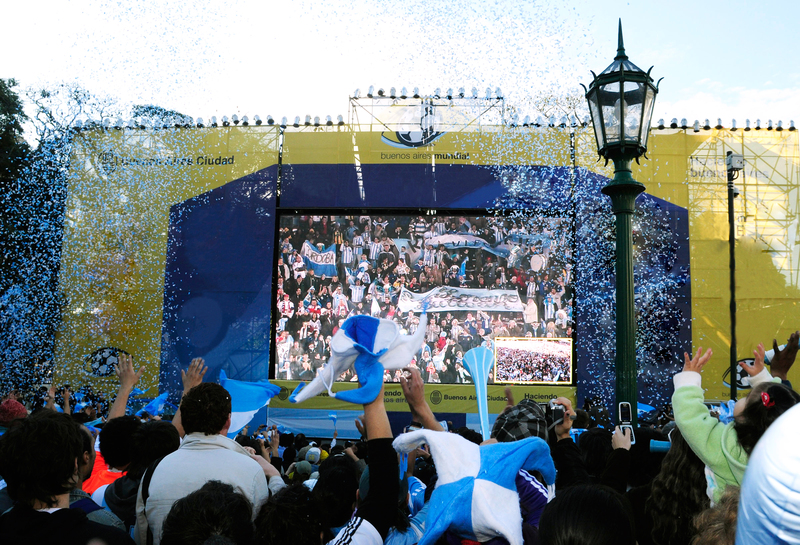 Each new edition of the World Cup changes the life of all porteños: in every Buenos Aires neighborhoods everyone gets ready to enjoy the most important event in world football. Four years sometimes seems too long, specially for Argentines, when it comes to football. Therefore, and exactly as in the 2010 World Cup, this year, two giant screens will be installed in public parks, so that everyone, tourists or residents, can enjoy the 64 matches of the World Cup. One will be located in Parque Centenario and the other in Plaza San Martín, which are the two key points where thousands of people walk daily. 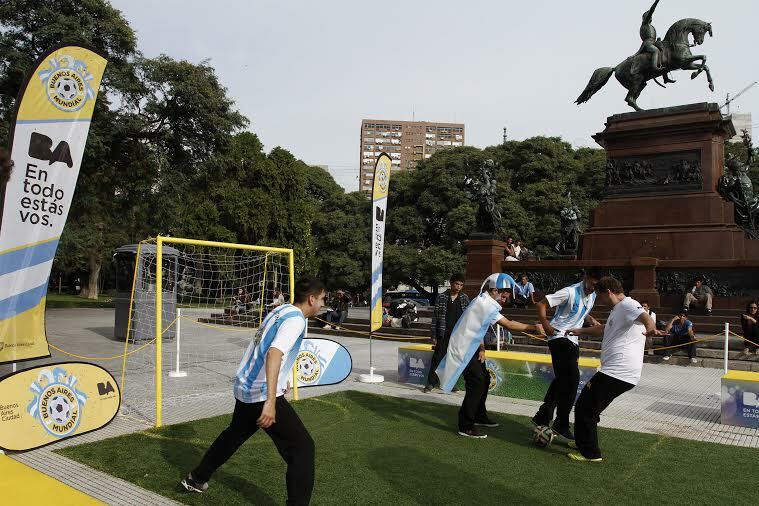 Previous to that, there are various activities in the streets of Buenos Aires: Until June 11 at Plaza San Martin there is a mini football pitch where you can participate to play games, kick penalties, or play football tournaments, among others. Former National Team players and special guests will be participating in some of the activities . Now, sometimes the weather is not good enough to be outside. What to do then? Watch it at Home Bar! We have a smart tv led full hd 46 where you can watch all World Cup matches, enjoying our great food and drinks. Enjoy the World Cup and support for your favorite team! And as the say: may the best team win! The Kayak app is worth downloading: Its sophisticated filters allow to search by criteria such as preferred airports for layovers (Android, iPad, iPhone, Nokia, Windows Phone; free). Find the itinerary you want, then wait till you’re at a computer and book via the airline’s Web site or an ­excellent travel agent (to avoid potential snags caused by online travel agencies). The Seat-Guru app tells you which seats are still available, study their pros and cons (which have the most legroom, which don’t recline, which are next to the lavatory) so you can choose wisely. We’ve heard that sometimes Seat Guru is not accurate, especially for United flights (iPad, iPhone, iPod Touch; free). There are several apps that promise to track your flights and notify you of any ­delays or gate changes, but FlightTrack Pro’s alerts are faster, more accurate, and more thorough than others. Android, iPad, iPhone; $9.99). The LocalEats app helps you to find that ­colorful local restaurant just two miles off the highway that you would never have known about. Choose “Nearby” and the app will pull up non-chain spots close to you that are recommended by local food critics. 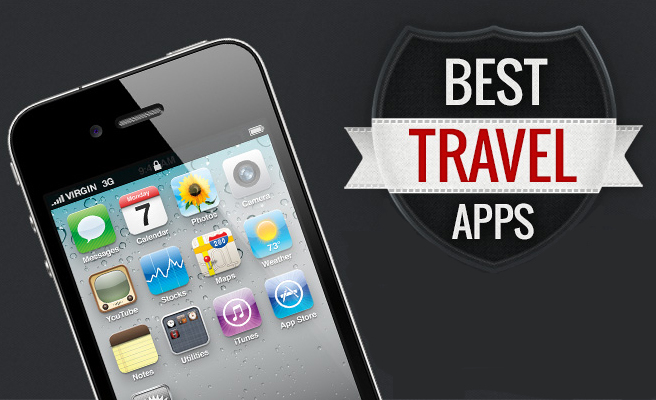 (iPad, iPhone, iPod Touch; 99 cents). The XE Currency app will help you to calculate dollar values instantly, using real-time exchange rates (Android, BlackBerry, iPad, iPhone, Windows Phone; free). Maplets provides maps for almost everything: national parks, ski resorts, subways, college campuses, rail systems, and much more. Download the maps when you have a free Internet connection so you can pull them up later when you don’t (iPad, iPhone, iPod Touch; $2.99). “City of Fashion” is a new event that invites you to discover Buenos Aires from the point of view of one of its most important creative industries: fashion & clothing design. Both emerging and well known designers will present their collections in different venues along the city of Buenos Aires. 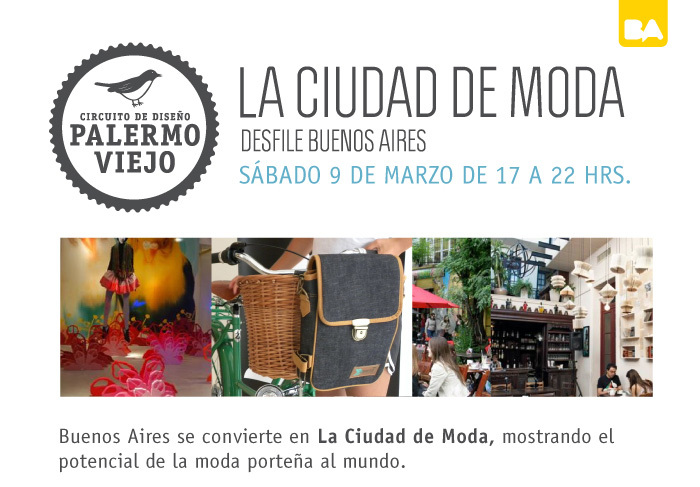 This coming Saturday, between 5 and 10pm, there will be a special fashion show in one of the most creative district of Buenos Aires: Palermo Viejo. There will be special art interventions, live music shows, street styling contests and many other activities. Where: Plaza Palermo Viejo, Costa Rica & Armenia | From: 5 to 10 pm. Alpargatas (a.k.a. Espadrilles) are a casual flat shoe that usually have a canvas or cotton fabric upper and a flexible sole made of rope or rubber material moulded to look like rope. The jute rope sole is the defining characteristic of an espadrille; the uppers vary widely in style. Originally brought to Argentina by Basque immigrants from the Pyrenees mountains, alpargatas quickly spread throughout the farming and rural communities. These shoes have been worn in Argentina for years and now they became a fashion: alpargatas are a boom in the United States and many European countries. With innovative designs, rubber sole an many colors, they are now marketed as an urban product. Have you got yours? Would you buy them? We welcomed Spring on 21 September and we have 21 British acts ready to rock Buenos Aires in the horizon! Fancy some of the big names? Kasabian, Suede, The Maccabees, Snow Patrol, Pulp, The Magic Numbers …..spoiled for choice? Do golden Oldies do it for you? Of course, including Rick Wakeman from Yes who is performing two nights at the Gran Rex doing two different shows with two different bands: Journey to the Centre of the Earth or The Six Wives of Henry VIII, your call? Robert Plant anyone? Marillion? One of the best guitars of Rock n Roll with Slash? Wanna dance yourself to oblivion? Enjoy the eight British acts at Creamfields or the three at the Buenos Aires Trance 5 Festival in this case, all coming from Belfast. More? Try Anjunabeats, or DJ Shadow? Boybands? “The Wanted” play GEBA so do avoid the area if you don’t enjoy loud shrills! Now if you want to see more than a show, someone’s love story with Buenos Aires, you won’t want to miss Joss Stone’s third tour of Buenos Aires! 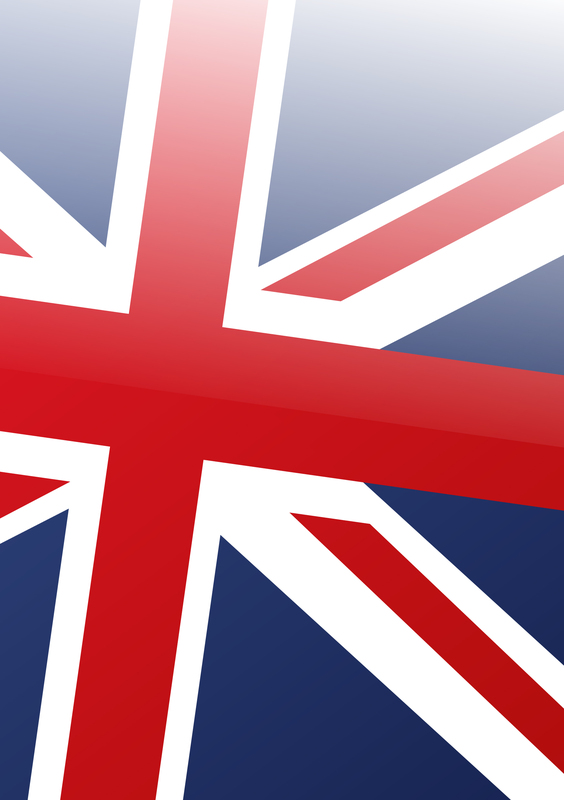 Ready, steady, go ….. get your tickets now and enjoy some of the Best of British…here, in Buenos Aires!